What are your thoughts on last week’s game against Hawaii? Another disappointing game from the offense, aside from running back Nico Evans. Still too much inconsistency across the board from this group. The defense was good — good enough for the team to win. I also through Dontae Crow more than held his own as the new punter, and kicker Cooper Rothe continues to be stellar. Defensive end Carl Granderson may have had only two tackles, but one was a sack and he had a 61-yard interception return for a touchdown. Wyoming’s secondary. The Cowboys will be going against a quarterback that completes 72 percent of his passes and has a lot of skilled guys to throw the ball to. The secondary must have one of its best game, both the corners and safeties. A good pass rush will help, but the Cowboys must hold up on the back end. It makes Fresno State one-dimensional offensively, it can run the ball and be efficient in the pass game and not allow Fresno State to turn them over. The Bulldogs have forced 16 turnovers, including 11 interceptions, this season. Wyoming came out with one of its more spirited defensive efforts against Hawaii, but the game was a microcosm of the Cowboys’ offensive struggles. If Nico Evans doesn’t produce, this offense doesn’t produce, which really shouldn’t be the case halfway through the season. Add the fact that Evans had the best game of his career in what was a very winnable game for Wyoming, and that only amplifies the frustration for players, coaches and fans. Evans is running the ball too well for the Cowboys not to be able to hit some shots in the passing game, which needs to – and should — happen if Wyoming wants to loosen up defenses from here on out. Who else but Nico Evans? Yeah, Carl Granderson and Logan Wilson stood out for a defense that kept Wyoming in it, but it’s scary to think about where this offense would be without Evans, who’s leading the Mountain West in rushing yards per game and yards per carry despite the fact the Cowboys haven’t had much of a passing game to help him out. Maybe coverage has dictated it. Maybe it has to do with the fact his knee isn’t still completely healthy. I’m not sure why it hasn’t happened yet, but at some point, I have to think Austin Fort becomes a bigger part of this struggling passing game. Coaches have repeatedly talked about how good it is to have him back at tight end after he missed three games with a sprained knee, but he wasn’t targeted against Boise State and only caught two passes against Hawaii. At 6-foot-4 and 244 pounds, Fort is a big body that should be a weapon in the middle of the field – or at the least a safety valve for quarterback Tyler Vander Waal as the Cowboys try to find some semblance of offensive balance. They get the passing game going and play a clean game. The defense should be able to contain Fresno State’s offense, but it won’t matter if the Cowboys don’t start scoring some points. And Wyoming hasn’t been able to do that despite Nico Evans’ best efforts in part because the passing game has had no answers when defenses corral Evans. Wyoming’s been good about ball security (just four turnovers), but if the Cowboys get sloppy against a defense that’s been one of nation’s best at forcing turnovers, it could get ugly. That was a game that the Cowboys are going to look back at the end of the season and wish they would have put away. The Cowboy defense did its job in holding the Rainbow Warriors to fewer then normal points and yards, but couldn’t keep them out of the end zone when it mattered most. The offense continues to struggle mightily, failing to convert many opportunities on Saturday night. If bowl eligibility is nip and tuck at the end of the season, this game will certainly haunt them. Nico Evans was the MVP last week. The guy is still a wrecking ball and leads the Mountain West in rushing yards despite missing time due to injury. Nico is the lone bright spot of the offense so far this season. If the rest of the offense was clicking like he is we’d have a very formidable team on our hands. Poke pick this week is Tyler Vander Waal. This will probably end up as a “out of left field” pick as opposed to my fellow writers here, but I feel like he’s due to put some numbers on the board. The coaching staff talks about every week “opening up the playbook” and getting Tyler throwing a little more. Maybe this will be the week they open it all the way up. Only chance the Pokes will have to win this game. Nico can’t do it all alone. Fresno State is a salty team. They will be the likely winner of the West division. Marcus McMaryion is playing well, as is the Bulldog defense. Wyoming will need to keep McMaryion at bay as well as finding a way past the defense. The Cowboys have to score on every opportunity that they get. If they don’t they will never keep Fresno down long enough to win this game. They need to be better at sustaining drives and keeping the defense off the field longer than four plays. Cowboys are very much not favored to win this game. Last time these two played in Fresno Brian Hill ran for 281 yards and two touchdowns. Nico Evans is certainly capable of that kind of performance. However, I just can’t see it this week. The offense has too big of a hill to overcome. 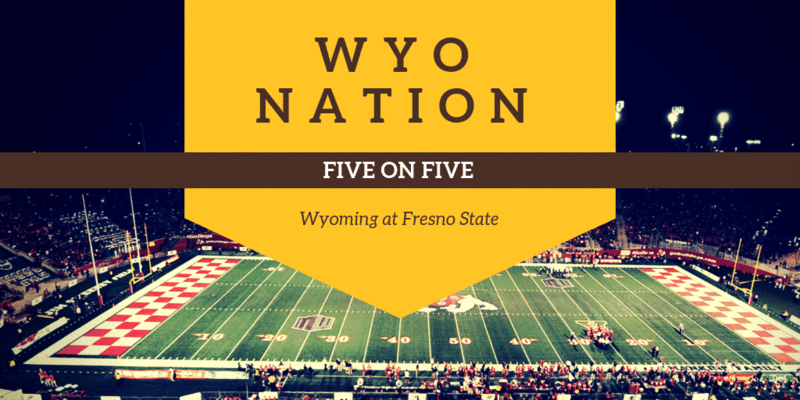 Wyoming 13, Fresno State 38. When your defense holds Hawai’i to 17 points on the island you should pretty much win every time. It’s a bad loss and no one can justify otherwise. This season has the potential to spin completely out of control with Wyoming expected to be the underdog in their next game at home versus Utah State before going to the road to take on Colorado State in a rivalry game. As I said on Twitter, the Wyoming offense is RB Nico Evans and RB Nico Evans is the Wyoming offense. They figure out how to be efficient in the passing game. The running game and defense are doing enough to win games but you have to be able to throw the ball especially when you need to in modern college football. I will not be holding my breath though because if you can’t pass against Hawai’i chances are you can’t pass against anyone. Disappointing and a game the Cowboys should have won. I am afraid that one will likely come back to bite them because they are going to be a borderline bowl team and that win would have gone a long ways. Carl had been quiet for a few weeks but his pick 6 was clearly the highlight of the game for the Pokes. Vander Waal has showed signs but he holds the ball too long, takes negative plays when he could throw it away and hasn’t been able to get things going outside of the 2 minute drill. The Cowboys have to get him going to be better. Vander Waal throws for over 250 yards and they are +2 in turnovers.